There are two interpretations of Lake Winnipesaukee. One is "Beautiful Water in High Place." 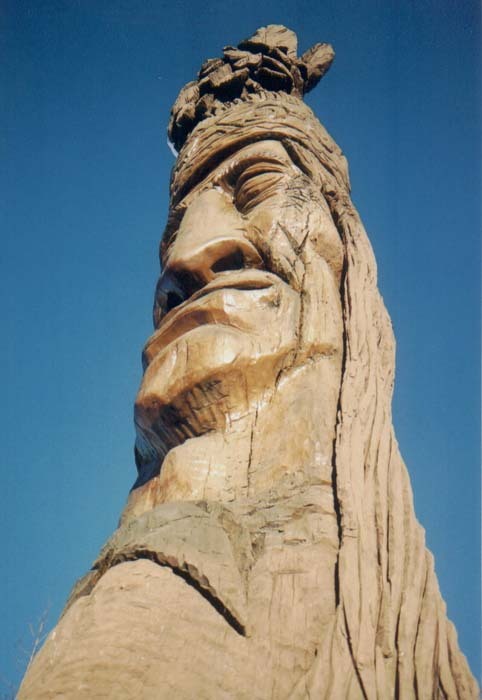 The second, More popular one, is "The Smile of the Great Spirit." One day, a young chief, Adiwando, from an enemy tribe in the south paddled across the lake and entered the village. Natives from Wonaton's tribe saw his bravery and did not stop him. After they were wed, the whole tribe went in canoes to the middle of the lake. The skies were dark and as they began to leave, t he sun came out around the canoe of Minola and Adiwando. 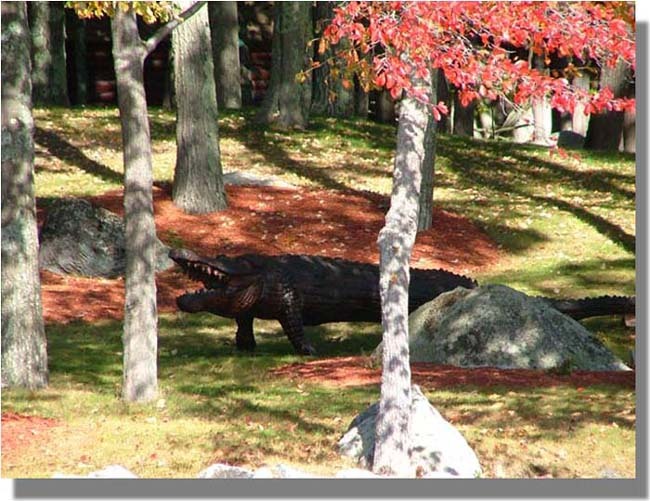 Wonaton thought it was a "good omen" and named the waters Lake Winnipesaukee or "The Smile of the Great Spirit." There are 240 miles of shoreline according to some; 183 miles according to others. There are 365 islands of which 274 are habitable. Surface are is 72 square miles. The lake is 9 1/2 miles wide and 28 miles long. It is 504 feet above sea level. Deepest part of the lake - 169 feet, southeast of Rattlesnake Island. The rest of the lake is between 20 and 100 feet deep. Rattlesnake Island has the highest elevation of 400 feet. There are eight cities and towns that border Lake Winnipesaukee in New Hampshire - Alton, Center Harbor, Gilford, Laconia, Meredith, Moultonboro, Tuftonboro and Wolfeboro. The route to drive around the lake from Meredith: Route 25 to Route 109 to Route 28 to Bay Hill. Road in Alton to Route 11 to Elm Street in Laconia to Parade Road (Route 106) to Route 3. Facts on ice out - Official ice out is when the M/S Mount Washington can reach all four of its ports without touching ice. The smallest Island - Becky's Island which is about 10 feet wide depending on water level. The largest Islands - Long Island (which has a bridge to it) and Bear Island. 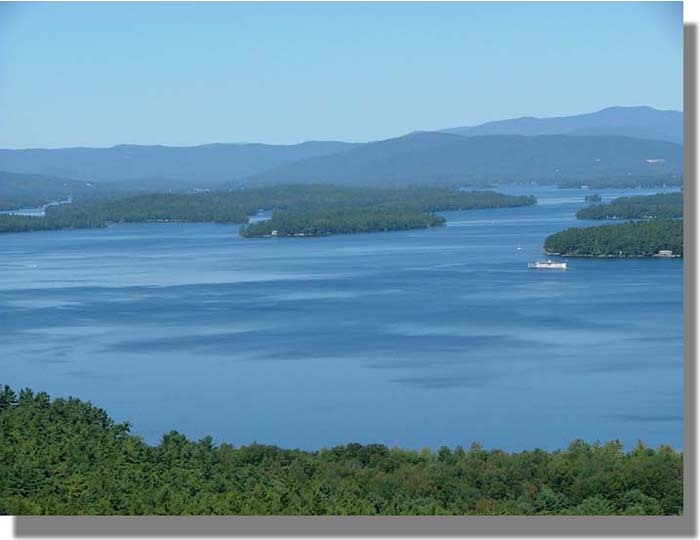 Lake Winnipesaukee has three islands with the same name - all are called Loon Island. Nineacres Island actually has 13 acres. Cow Island is sometimes called Guernsey Island - The island was once used to quarantine cows brought from Europe. Lake Winnipesaukee in New Hampshire freezes over early to mid January. Lake temperature varies depending on the weather: A warm, sunny summer - up to 79; A cloudy, rainy summer holds the temperature between 67 and 74. Wolfeboro is the oldest summer resort town in the US. 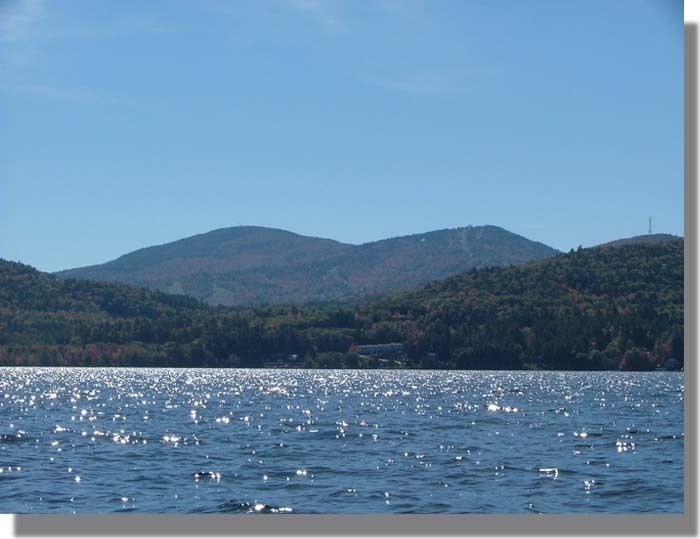 There are over 273 lakes and ponds in the lakes region of New Hampshire. Facts on the number of islands that can be reached by bridge - six; Black Cat Island, Long Island, Oak Island, Governor's Island, Worcester Island and Christmas Island. Islands measured from Center Harbor - Mile Island, Three-Mile Island, Five-Mile Island and Six-Mile island. Ossipee Mountains border Moultonboro on Lake Winnipesuakee. Wild animals in the Lake Winnipesaukee region: Otter, beaver, muskrat, mink, fisher, moose, deer, black bear, coyotes and bobcats. There are 75 numbered buoys: 1-31 and 39-83. Facts on the red and white buoy - proceed on the south and west side. Facts on the black and white buoys - proceed on the north and east side. Before the dam at Lakeport was built, the water level was 3-5 feet below what it is now. The area between Deven's Island and Little Bear Island is sometimes referred to as "Hole in the Wall." Birch Island and Steamboat Island are the only two islands connected by a bridge. Weirs Beach got its name from the native Indians. A long time ago, natives built a basket, call a weir, to catch fish (Shad) that migrated through the Weirs channel. The constant use of the weirs in the channel led to the name Weirs Beach. "The Lady of the Lake" built in Lakeport in 1849 was the first boat built over 100 feet in length that provided public transportation on Lake Winnipesaukee in New Hampshire. The original "Mount" was the "Lady of the Lake." When the Boston and Maine decided to cease "the old steamship business" during the 1920's, the Mount Washington was sold. It was turned into a passenger vessel for summer tourists. 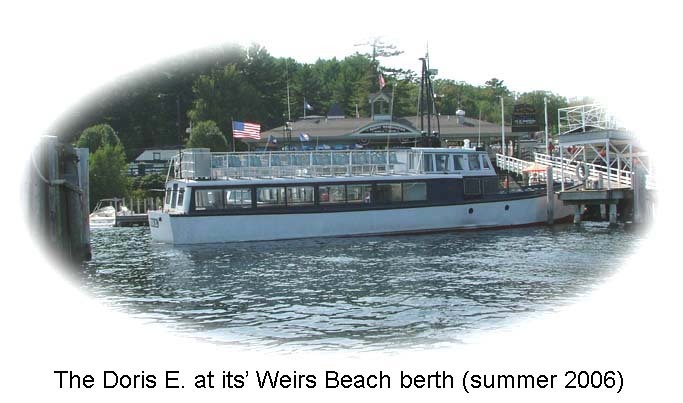 The M/S Mount Washington stops at Wolfeboro, Alton Bay, Weirs Beach, Meredith and Center. Harbor. The Mount runs from ice out until mid October. 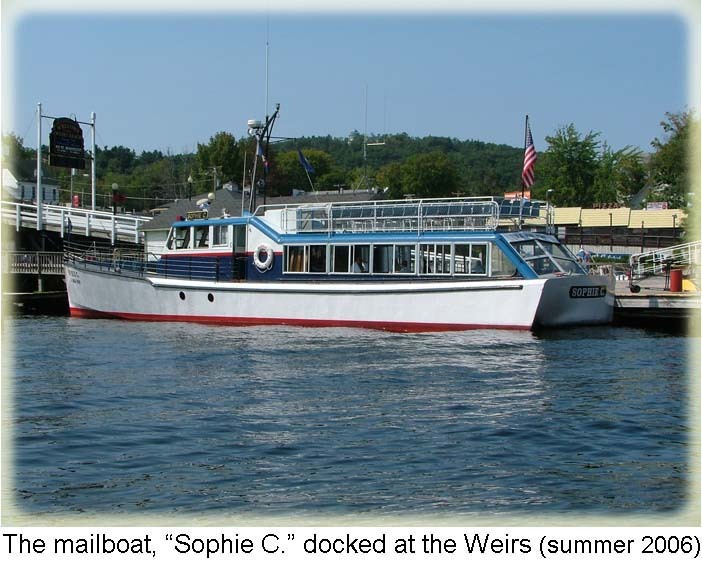 The Sophie C. is a mailboat on Lake Winnipesaukee. It delivers mail to the people who live on the islands. It was named after the owner's mother.